I love to organize. I always have. I always say if I wasn’t a blogger I would love to have a personal organization business. I think it would be so fun! I am always trying to declutter/organize areas in our house to make them easier for us and because I hate the look of clutter. 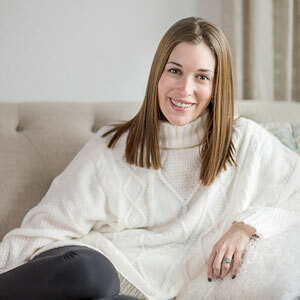 Today I am sharing 10 things you can organize and declutter in under 30 minutes! Counters in the kitchen: I hate cluttered counters. I try to not keep stuff on our island or our kitchen table. We only keep what we use often on the counters. Every other appliances etc is put away. We do not keep food on the counters either! A junk drawer: We all have that drawer that random coupons, receipts, stamps, etc get thrown into. I try to take a few minutes every month or so to clean it out and organize it. Linen closet: This may mean refolding things on a shelf, or just donate unused items or old, worn items. Coat closet: Like a linen closet sometimes things just pile up. We tend to use our coat closet and basket in it as a catch all. Candles, random seasonal items, etc all get thrown in there. This makes me feel like I should take a crack at ours soon! Toys in the playroom: I feel like our playroom is just clutter constantly. Liam gets A LOT of new toys (grandparents spoil him) and we are horrible about putting away older ones. Plus we keep all of our board games in there (I collect them-dork alert) and it’s something I am constantly trying to organize. Baby’s dresser/closet: I go through Liam’s dresser/closet any time he outgrows a size. I take all clothes in the older size and vacuum seal them. We are saving them for future baby number two! Your dresser: Dressers are like closets to me. If I haven’t worn it in a year it gets donated! I try to tackle one drawer at a time. I take everything out and make two piles (donate and keep). The keep pile I refold and reorganize. The donate pile goes in a bag to get donated. Nightstands: I don’t keep much on/in mine. But this didn’t used to be the case. This is a good one to go through once or twice a year and throw out expired/old medicines, random things you put it in, etc. The fridge/freezer: I am weird and LOVE cleaning our fridge and freezer. I take everything off each shelf, wipe it down and throw out what’s old/expired. I also try to keep things in containers as much as possible to maximize space and also prevent spills. Bathroom cabinets: This is another one I do pretty often. Old makeup/products, things you don’t use, travel bags that need to be thrown out, expired medicines, etc. I know personally when I do these things I feel so much less stressed and like our house is so much more organized and put together. 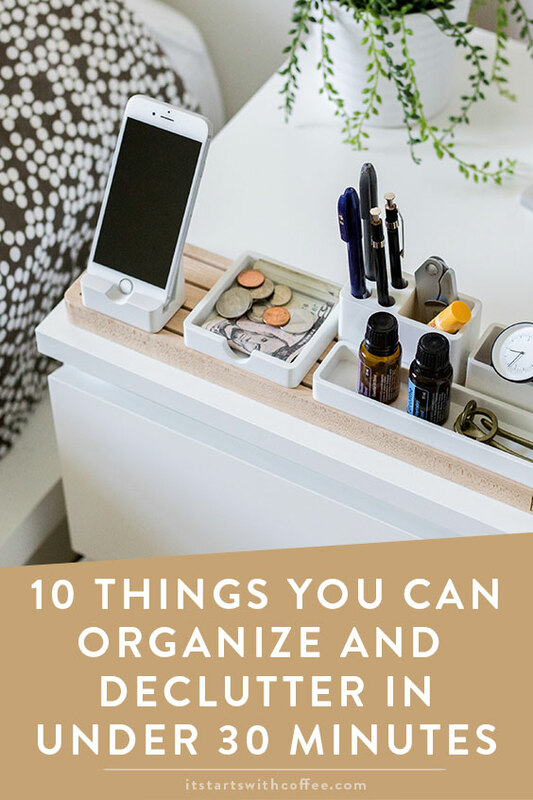 I hope you agree about these 10 things you can organize pretty quickly! Let me know if you try it out and what you think! I need to follow these steps ASAP!! Thanks for sharing! Love this — I’m always trying to remind myself that even a tiny bit of decluttering makes a huge difference! I really have to go through my clothes and makeup. I feel inspired to start sorting through them. Love this post. This a great list you put together, actually, as I’m writing this, I’m taking a break from cleaning my bathroom cabinets too! These are such great tips. Our entire apartment is totally cluttered at the moment, and need to fix this situation soon! Yes! Thank you for including the “smaller” things like drawers, and linen closets. We tend to forget about these smaller spaces because we are so focused on the outer spaces. Yes!!! Absolutely! When my surroundings are cluttered and disorganised, I feel like I am disorganised too and I can’t focus on my work. I REALLY need to organize my dresser because It is an absolute mess! I always make it a point to declutter every two weeks and I am getting pretty good at letting things go. That wasn’t me a few years back. Now that I see how easy it is to keep things organized, I have turned decluttering into a hobby. Now if only my sons would learn to do that too. I’m horrible at organization! Thanks for the tips — I need to start with my children’s toys. They are all over our home. I always need to organize my home office. I feel like I can’t think straight every time something’s out of place. The kitchen counter would be easy peasy. I can do that in a flash, but the toys in the playroom? OMG. That would take longer! I need to get plastic storage bins and label them so the kids can pick their stuff up and keep their playroom in order every time. Oh gosh, I really need to organize my nightstand. It’s full of random stuff. When we moved, I just taped the drawer shut lol. I feel the same way. If I wasn’t moving so much I would be organizer. I love it! !